IF “PHOTOGRAPHY IS TRUTH,” as Jean-Luc Godard once proclaimed, then photographer Jo-Anne McArthur’s camera is like a floodlight, illuminating what is so often hidden and dismissed in our society— the plight of animals. With her trained eye and empathetic resolve, she documents the suffering, distress, confusion and sadness of the ones who are confined; then shows us the joy and contentment of those lucky enough to be free. Jo-Anne has been putting truth on film and pixel for over ten years. 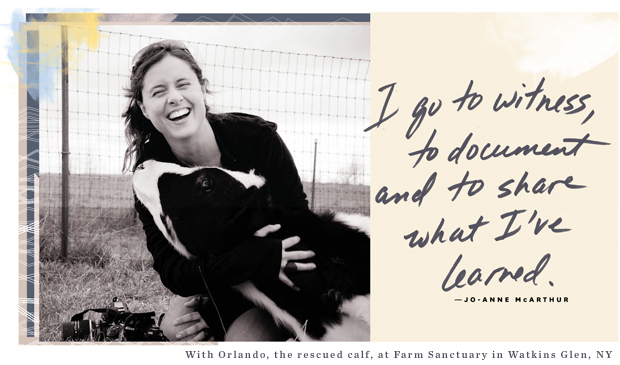 She has traveled the world with her documentary project We Animals, contributing her photos to countless animal liberation campaigns. Each of her images is at once a question that lingers, a confrontation with our own conscience… and a call to action. Most recently, she documented the transport of pigs to slaughter in below freezing weather in Canada, as part of the Toronto Pig Save vigils. Her images will be featured in the upcoming film The Ghosts In Our Machine (directed by Liz Marshall), which tells the stories of animals who are used for food, clothing, entertainment and research. Jo-Anne appears to be ubiquitous, working tirelessly to make a difference. 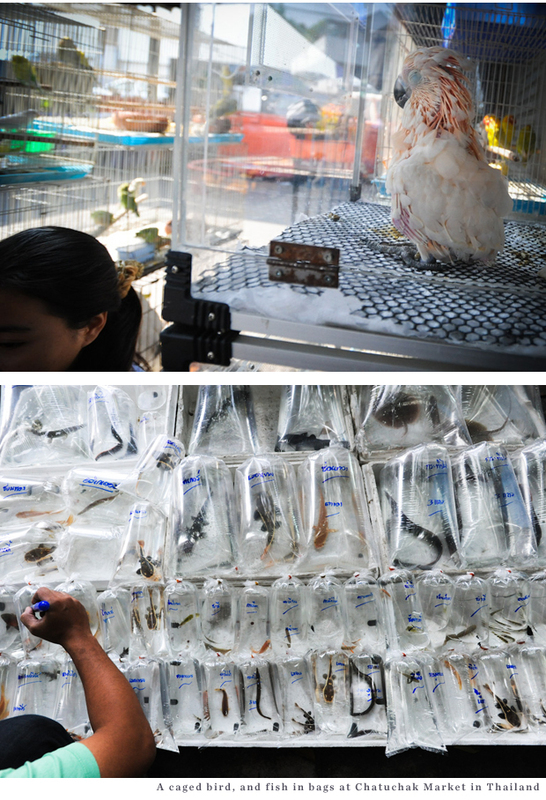 Here, she talks to us about the drive behind her work, and her love for animals. Why did you feel it was important to be there on those freezing afternoons in Toronto to photograph the transport trucks? It’s in extremes of weather that the pigs suffer most. The pigs are acclimatized to the indoors until they’re sent to slaughter, so the cold is a big change for them and they don’t have much hair to keep them warm. By the time they’ve spent hours in those transports in extreme weather, many are huddled on the floor, unable to move or respond. Some are dead. When I’m there to witness and document, I can’t help but put myself in their position. There I am, outside with cold feet and a cold nose, but they are bare-skinned and exposed to the wind rushing through the transport for long stretches of time. Their pain is crippling. Their forthcoming deaths are bad enough, but this as a prelude? It’s shameful. Needless deaths and needless suffering. I go to witness, to document, and share what I’ve learned. What reactions have you been met with? When we’re at Toronto Pig Save vigils, we’re met with extremes of opinion, to be sure. Some honk, wave, give thumbs up and enthusiastic support for us as we stand vigil on what has come to be known as “Pig Island”. Others make sure we see their middle finger or let us know with much originality that they love bacon. The trucks started detouring, or not going into the left-turning lane so that we couldn’t document the inside of their trucks. For the most part though, there haven’t been many efforts to censor. Mind you, the police get called fairly regularly but there’s not much they can do except tell us to obey the rules of the road. Toronto Pig Save takes a Gandhian approach to protesting; this is a peaceful movement and a pro-labour movement as well. We’re not there to anger or antagonize anyone, we’re there to open people’s eyes about the pig slaughterhouse in the neighbourhood, where 6000 pigs a day are killed. We’re there for the pigs and we’re there to show an alternative to treating animals this way. Describe your emotions looking at the pigs. 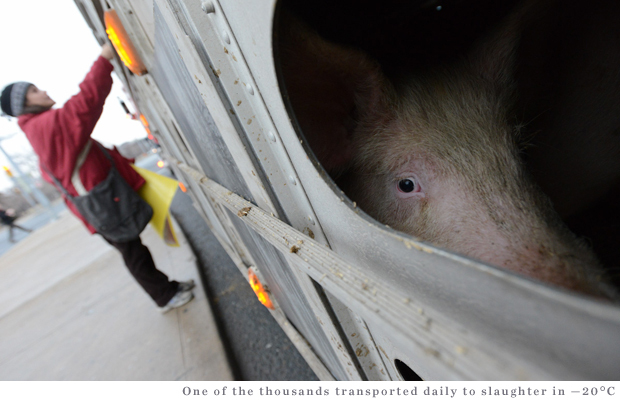 People rarely get to witness the transport of animals to slaughter, because of the industry’s notorious secrecy. Yes, it’s an industry shrouded in secrecy, but if we take steps to witness, there’s never far to go before we can see what happens. Transports carrying animals are always going up and down most highways and in and out of cities. We believe in witnessing so that we can share those stories and show those photos, so that others can know what it’s like for the animals as well. When you witness this sort of pain and suffering, it changes you. It changes most people, and makes them want to take action, makes them want to stop eating pigs. Countless times, people are moved by the sadness in a way that motivates them and inspires them to return to witness again, and to speak out about what goes on. When we do this as a community, we can support each other, and we do. It helps to process the feelings of sadness and hopelessness. The community is growing; Toronto Pig Save has now become the “Save” movement, with groups cropping up in Canada, the USA and in Australia. Witnessing as a community is working, it’s inspiring people in so many ways. But how do we feel about seeing the pigs in transport? It’s just plain difficult. Many of us cry. Many of us speak kindly to the pigs as they go by. 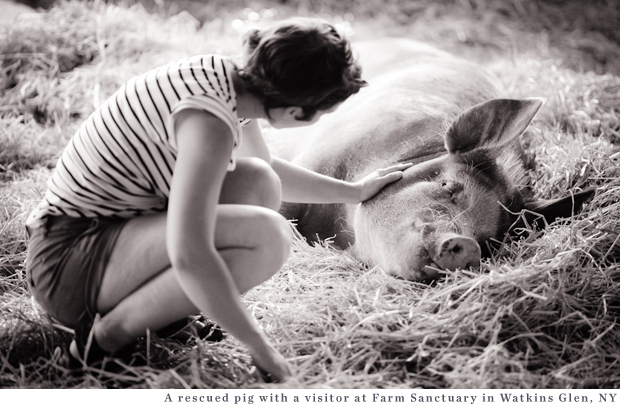 In warmer weather, many pigs come to the openings in the transport walls and sniff our hands and faces, and we pet their faces. We try to show them some kindness before they die. On a personal level and as a photographer, I balance the feelings of sadness with the necessity of work. I’m there to take really strong images so that others can witness too, and I need to do that work well. I have to concentrate on framing the picture well, documenting the pigs’ faces, eyes, injuries, the cramped conditions. It’s depressing work but it’s an honour to be able to contribute to the movement, and to change, and it always moves me to be with the animals. This is always where my heart is: being with the animals in some way, trying to help, sometimes bringing them comfort if I can. Your photography is your activism, and your camera can be called your weapon in fighting injustice. 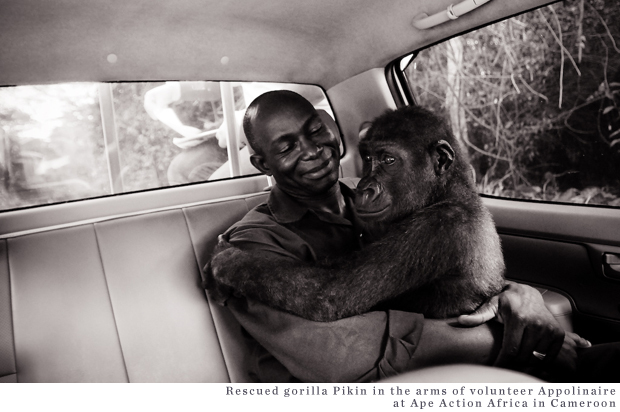 What has led you to photography, and specifically to documenting the plight of animals? Yes, photography is my tool for animal rights activism, and it’s great to see so many more people doing this as well, be it undercover or wide out in the open, documenting injustice everywhere. What led me to photography… while I was studying at University I took an elective black and white printing class, and after that first class, that was it for me, it felt as though I’d found my “calling.” I’d always loved photography, but at that point my love deepened and I knew it would be a great tool in life for me, because I’m so curious about things… cameras can sometimes act as an all-access pass to the lives of others. I had some good advice along the way too; my mum had told me to figure out what I love doing, then find a way to make a living doing it. This was great, especially when so many kids are subconsciously fulfilling their parents wishes, or doing what they think they should do, when they pick their schooling or career path. I also had some great advice from a photographer mentor of mine, Larry Towell, who told me to stop looking so far afield for stories, to look inside instead. “Do what you love” and “do what you know” are things he said, and that struck a chord. I loved helping animals, always did. Soon I realized I could combine my loves for photography and helping animals. I don’t make a living doing it, mind you (I do commercial, event and portrait photography to pay the bills), but I’m definitely doing what I love. How do you remain in positive spirits, despite the suffering you’ve seen? I try to balance the bad with the good. I have to. We have to. Being beaten down with the suffering every day leads to burn out, compassion fatigue, or a dropping away from activism and the issues we care about. I suffered and recovered from PTSD because of what I’ve witnessed through shooting for campaigns and the We Animals project, so I have learned to take care of myself and to celebrate the good. We really all need to do this; find balance in our activism, and take self-care seriously. We can keep our optimism and our eyes on the goal by focusing on the good happening all around us, by supporting one another in our work and by celebrating change. Don’t forget change is happening, and it’s happening because of millions of compassionate people out there making small and big adjustments to their lives, things that will ease the suffering of animals. Celebrate the good. Keep your eye on the prize (which is animal liberation, of course!). What kind of effect have your images produced in people? One of the best parts of We Animals for me is hearing and reading people’s responses to it. I get a lot of emails about the work and how it has changed people’s worlds. I know the photos are effective, and that’s part of what keeps me going. Many people have written to me about giving up meat after seeing and reading work from the We Animals site, and many have found a calling in activism as well. It’s pretty exciting! Where is your work taking you next? I continue to attend Pig Save vigils and will actually be documenting Melbourne Pig Save in early March, in Australia. I’ll be there for a month to work with various animal rights groups, as well as documenting rescue and sanctuary work. Then I’ll be in Senegal doing volunteer humanitarian work (photography) with a Canadian medical team, then from there, heading north to Europe to work with some great teams of investigators again. Lots going on! Liz Marshall’s film The Ghosts In Our Machine will be in theaters this year as well, so there will be a lot happening around that. It’s a strong film about the moral question of animals as property versus sentient being, and will be a force in bringing animal issues to the fore. I hope to be back in India by the end of the year, and I’ll continue to help and contribute to local and global campaigns as much as I can. 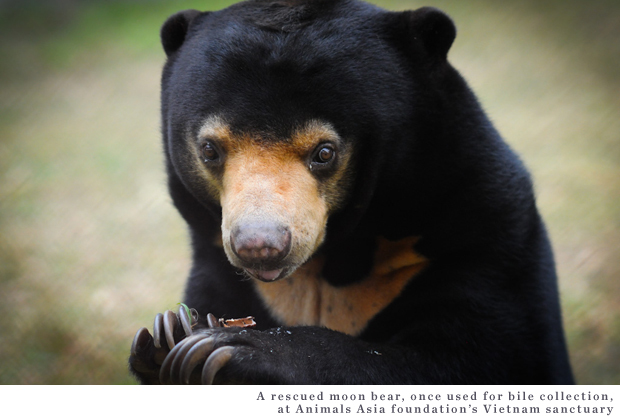 The photos from the We Animals archive are made available to groups who are helping animals and furthering a message of compassion, so it’s great that the archive can continue to be useful even while I’m doing other things. You are truly my hero. Love what Jo-Anne McArthur brings to the world of animal rights & compassion. if she is speaking at a venue near you…go see & listen….it may just change your life & the lives of animals …for the better.